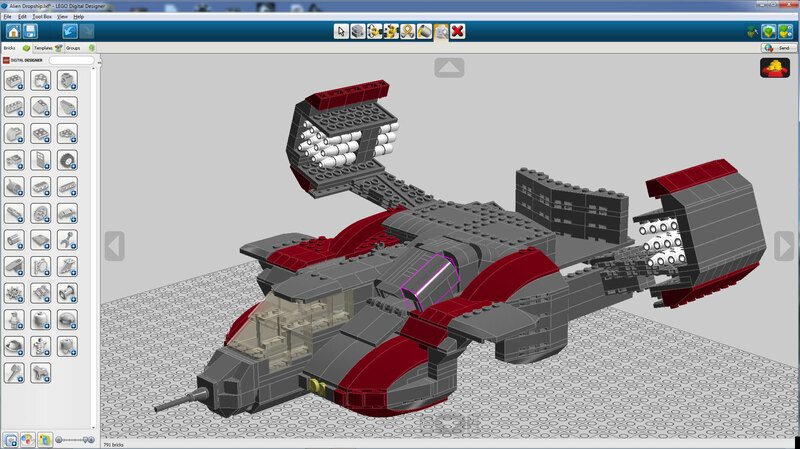 Many have been interested, so I thought I’ll share how I built my own creation (MOC) Lego Dropship from the Aliens movie and what software I used to generate the instructions. The movie Aliens is one of my all time favourite movies (after Star Wars – the originals). I can still remember when my brother and I first watched it, record from the TV on VHS. There are just so many awesome things about it. The Dropship has been a MOC (My Own Creation) that I’ve been wanting to build out of Lego for a while. Most of my Lego is from the 80’s and 90’s and well used. As with most bricks from that period, they came in only 6 or so colours and mostly just basic blocks and slopes. I do own a few current sets and I really enjoy all the new parts especially the curved slopes. The Wedge 8 x 3 x 2 Open Left/Right is one piece that I really like. It has a really interest shape and I often used it as a feature piece like in my Research Lab Transporter. I had seen a few attempts from other people online, but the proportion often didn’t look right or they where much bigger than I wanted to build. I spent at long time thinking about how it might be built. Looking at pictures online and paying attentions to the shape of the Dropship and what parts I could use to replicate the shapes. Knowing that I would not have many of the pieces need and not in the right colours, I started working virtual with Lego’s Digital Designer. I have been using for about 18 months and able to mock-up builds fairly quickly. I have used 3D software packages before so it wasn’t too hard to learn how to move around and place pieces. The hardest part is finding the right piece from the 1000s of bricks available. A night or two work – Focusing on the shape of the front. 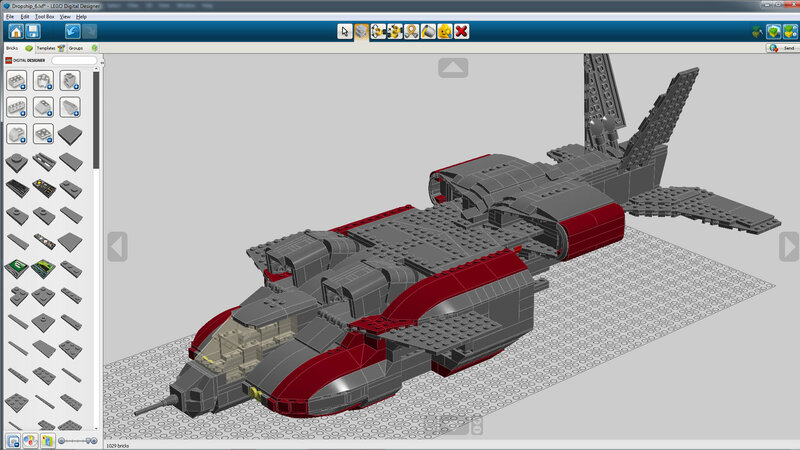 A couple more nights work – Shape of the top thrusters improved and back half built. Once I had my design looking good on screen it was time to see whether it is possible to build in real life. I often find that my virtual designs aren’t structural sound for swooshing, which is a must for any space craft. 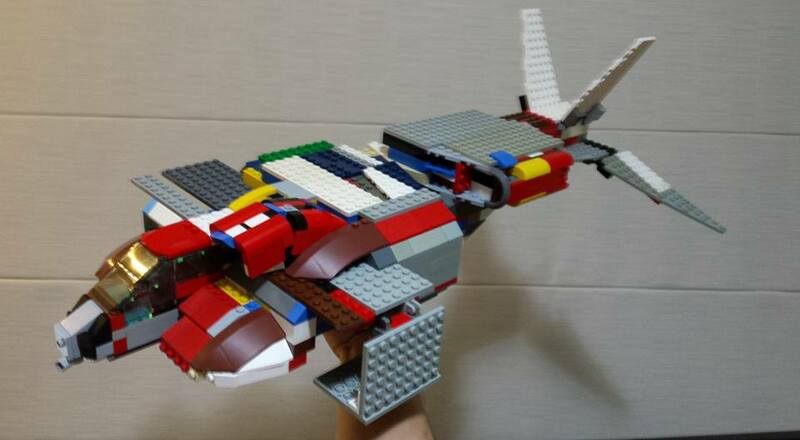 Copyright © 2019 Dan's Brick Builds.